The 1908 National League season saw a fierce struggle between the Chicago Cubs and the New York Giants. When they met with the Pennant on the line, there was a last minute change in the Giant line up. 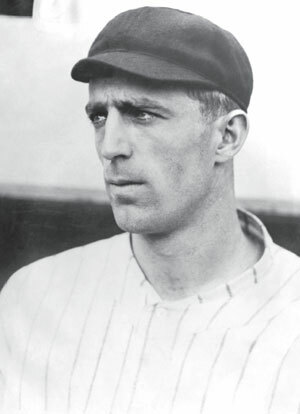 The Giant’s first baseman had a sprained back, and substituting for him was an eager nineteen year old named Fred Merkle who was looked at as a rising star. The game was tied. In the bottom of the ninth, the Giants were at bat. There were two outs, two men on base. The winning run was on third. Fred Merkle was on first. The batter hit a single, and the runner on third lumbered home. The Giants had apparently won the game and the pennant. Jubilant Giant fans poured onto the field while Merkle was still on his way to second. Alarmed by the crowd suddenly bearing down on him and convinced the game was over, he ran straight for the clubhouse. He didn’t go all the way to second base. The Chicago second baseman noticed it and knew if he could get the ball and touch second base himself, the winning run would be canceled by a force-out. He had to find that ball. One of the New York coaches saw what was happening, ran for the ball, and threw it in the stands. A fan in a brown bowler hat caught it and started home with his new trophy. Two Cubs players chased the man down through the mob and tried to take the ball away from him. When he resisted, they knocked him down, grabbed the ball, ran back to the field, and threw it to the second baseman, who, holding the ball, jumped up and down on the bag to make sure the umpire saw what he had done. A lot of people in this world think they’re safe. That the game is over and everything is grand. They’re not that bad of a person and that if they are just a so called “good person” that they’re headed home to heaven. But they’re simply presuming. They haven’t touched base and when the game is over, they’ll find out they’ve lost. Don’t presume. There’s only one way to heaven and that’s through Jesus Christ, God in the flesh. He’s the only one that can deal with our evil and sin which is in everyone on the planet. No exceptions. He died for that purpose but only those who believe and repent (turn from their way and live in accordance with His spoken word, the Bible), will be received into eternal life and heaven. This is not about head belief. It’s about life belief which is the only true belief. Believe. Repent. Live. When you’ve done that, you will have officially hit it out of the park. Pingback: Perils of Presumption | Berean Home Fellowship Perils of Presumption | Teaching independence in dependence on God.